to be written by someone who knows how to make words dance and readers jazzed. these sections are present in the attachment. We do software development and you can see our service catalog at development labs for example. 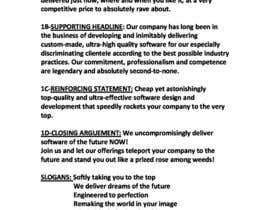 The headline of our page with a unique selling proposition that would attract visitors and drive home the purpose of our page. -"Venture" or "new venture creation" - we like to be a part of new venture creation, building the software that will make our customers ventures successful. 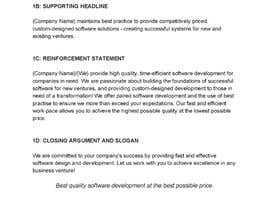 -"Software" We are a software development company selling software development services. 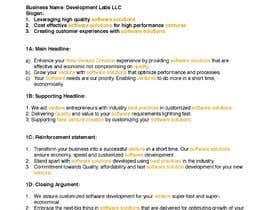 - 'paired software development "
There may be a few rounds of editing the copy you make when we put it up on the site to make sure the fit and finish is correct for the web and the page and the personality development labs wants to project. ATTENTION!!! - All copy must be original creative content.